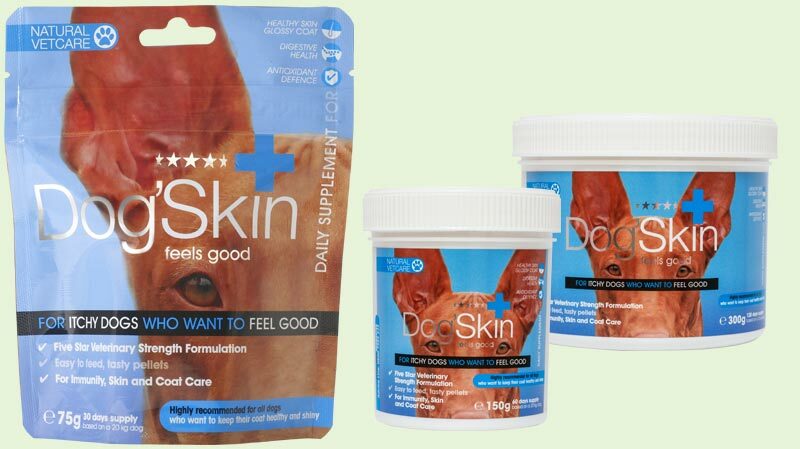 Natural VetCare Dog'Skin is a veterinary strength supplement which supports the needs of dogs with any sort of skin challenges, and helps give healthy skin and a glossy coat. It combines Essential Fatty Acids, bio-available sulphur, biotin and nutrient rich sea algae extracts to give strong shiny hair, nourished skin with elasticity and excellent nail strength and growth. An extra broad spectrum of vitamins and minerals are also provided for beneficial skin and hair nutrition. Hydrolysed poultry protein, Methyl sulphonyl methane (134g), Fenugreek seed, Salmon oil, Calcium carbonate, Liquorice (48g), Chlorella (dried, 40g), Yam root, Linseed oil, Glutamine, Dextrin. Selenised yeast inactivated (E3b8.10, 1990 mg, 1.99 mg Selenium), Zincoxide (E6, 11700 mg, 8400 mg Zinc). Biotin (10.8 mg), Calcium-D-pantothenate(1150 mg), Inositol (1000 mg), Nicotinamide(1050 mg), Vitamin A (E672, 133000 I.U. ), Vitamin B1 (310 mg), Vitamin B12 (5.37 mg), Vitamin B2 (213 mg), Vitamin B6 (308 mg), Vitamin D3 (E671, 17300 mg), Vitamin E(3a700, 13300 I.U.). Below are some recent questions we've received regarding Natural VetCare Dog'Skin Supplement, including answers from our team. This comes in a powder form. Is omega 6 OK ? Hi , I have just ordered this item for my doberman dog William .He has very bad skin, and has been on and off antibiotics all of his 18 month life , I want to do everything I can to help his condition naturally so I've been reserching and came across an article saying omega 3 is excellent for bad skin conditions but omega 6 should be avoided as it can actually promote inflammation which is exactly what I don't want. I've looked at the ingredients and have noticed omega 6 is in this product but have read the reviews and they seem to be good. He scratches and bites himself raw , do you think the omega 6 in this will promote his inflamed skin more or do the other ingredients out way that ingredient to help? My dog is allergic to poultry - ingredients? I have trialled the Prescribed CaniSkin which worked quite well but is difficult to get in smaller quantities from my vet, so though I'd try this one. However I see this product has 'hydrolised poultry' as an ingredient. What does this mean and should avoid feeding this product if my dog is allergic to poultry? If the poultry is properly and adequately hydrolysed (and I believe that it is) then it is fine to feed to your dog. Hydrolysis in this situation means that the proteins in the chicken have already been broken down into smaller molecules. Allergies can only happen in response to proteins of some sort and it that is to chicken protein, then hydrolysed chicken will be safe to give because the molecules which are normally recognised and responded to by the immune system, no longer exist in the product. Can my dog take this along with cod liver oil tabs?? You can give these together, but do not give a large dose of either. As long as you stick to the normal feeding guidelines it will be fine. There is a certain amount of vitamin A and of vitamin D in both products. Very high doses of these vitamins are toxic, but the amounts present are well below what would cause trouble as long as you do not over-do it. Can dogs with renal failure consume this? My dog has a chronic renal failure with the creatine level at 1.9 (still at the initial stage. other figures are within the normal range). Is it okay for him to consume this product? This has a fair amount of protein in it and dogs with reduced renal function are bet with low levels of protein in the diet. I would suggest an oil-based supplement such as Efavet instead. That should help and be safer.